This week we’re kicking off our 2017 Fitness Plan with the 21 Day Fix. I usually struggle to put together this meal plan. It’s hard for me because when I plan our menu I think in terms of recipes. The 21 Day Fix (see my full review here) uses a color coded portion control system and requires you to think in terms of food groups. I usually try to break the recipes down into the food groups but this time I used my newly created 21 Day Fix Menu Planning System! It’s similar to my “On the Diet” Menu Planning System. I may have hinted at this before but I’m super excited to be working on making my simple Meal Planning Systems available to you soon! Let me know if you’ve like to be in the test group. Anyway, the 21 Day Fix is always a great way to be more conscious about what we’re eating and put our eating habits back on the right track. One great things about the 21 Day Fix is you can still have wine. Since I’ve got Bunco this week I’ve planned ahead and swapped out one of my yellow containers so I can enjoy some wine! I’ve got two versions of the Menu. One is the regular version and the other is a spreadsheet I found on Fancy House Road you can use to tally up your containers. 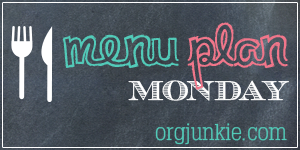 The spreadsheet makes menu planning for the 21 Day Fix so much easier. Click on either menu to download, edit and print.